The death toll from a devastating earthquake and tsunami has soared again on Tuesday as officials in Indonesia said over 1,200 have died. The bodies of at least 34 children have been discovered inside a church in a remote northern region of the Indonesian island of Sulawesi following Friday’s devastating magnitude-7.4 earthquake and ensuing tsunami, a spokesperson for the Indonesian Red Cross told reporters. The discovery was the latest heartbreak in an excruciating recovery effort that is just beginning to get underway as the death toll climbs. To date, at least 1,234 people have died in the catastrophe, but a local report has described scenes of widespread tragedy, with "bodies everywhere." The children were apparently attending a Christian bible camp when they were killed, Red Cross spokeswoman Aulia Arriani said. While 34 have been counted so far, Arriani said, more bodies are expected to be recovered, but it could take some time. With no heavy machinery available in the remote region of Sigi, there's no way to lift the concrete rubble and dig through the carnage. Damage has been reported along the coast, where houses, cars and people were swept away in waves that peaked at around 20 feet. Volunteers in Palu, a city on Sulawesi, have begun preparing for a mass grave with enough capacity to bury more than 1,000 people. The number of dead is likely to rise as response teams reach damaged roads in the affected areas, many of which have been ripped apart from the tremor and littered with debris. (Arimacs Wilander/AP) Rescuers try to rescue a 15-year old earthquake victim Nurul Istikharah from her damaged house following earthquakes and tsunami in Palu, Central Sulawesi, Indonesia, Sept. 30, 2018. The situation in Palu, the largest city affected by the quake, is so desperate that a military supply plane was unable to land there Sunday because desperate residents waiting for planes carrying much-needed aid had overrun the airport, a representative for an aid organization with volunteers on the ground told ABC News. 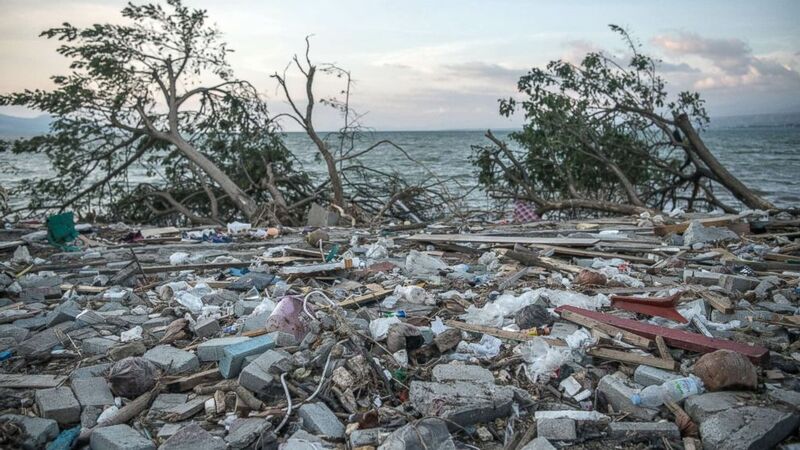 (Carl Court/Getty Images) Debris and uprooted trees lie on the beach following a tsunami, Oct. 1, 2018, in Palu, Indonesia. “There was a fear of the crowd mobbing the plane; people are so desperate for aid,” he said, requesting anonymity. Stores have been “cleaned out” of food and supplies and even gas stations have been looted, humanitarian workers say. As a result, people in Palu are largely without any means of motorized transportation, which is further complicating the aid response. Security is the top priority for the rescue teams, the aid worker said. (Jewel Samad/AFP/Getty Images) An aerial view shows the earthquake and tsunami devastated neighborhood in Palu, Sulawesi, Indonesia, Oct. 1, 2018. 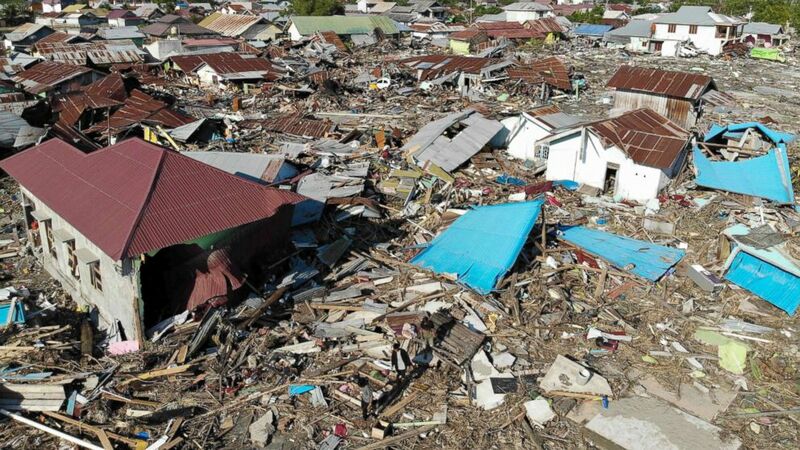 Most organizations are attempting to send aid from the island cities of Makassar and Manado to Palu, a northern Sulawesi city of 330,000 people. There were more than 100 camps for internally displaced people already with just under 50,000 people in Palu alone, an aid team told ABC News. North of Palu, in Donggala and closer to the epicenter of the quake, there is a need for heavy equipment in order to clear roads and lift slabs of concrete from broken buildings. But transporting such machinery is impossible when roads have been cracked open, leaving crevasses, or blocked by rubble, trees and other debris. So towns like Donggala, which has a population of around 220,000, have been difficult for aid workers to reach. Meanwhile, questions have been raised about Indonesia’s warning systems for alerting citizens of incoming threats. The Meterology, Climatology and Geophysics Agency (BMKG) issued a tsunami warning but it was lifted around 20 minutes after the earthquake, reportedly after the tsunami had already hit Palu. Furthermore a spokesman for Indonesia’s national disaster agency BNPB admitted in a press conference on Sunday that Indonesia has not had a functional tsunami detection system offshore since 2012, a spokesman for Indonesia’s national disaster agency BNPB said at news conference on Sunday, adding that all of the 22 buoys equipped with sensors and scattered across Indonesian waters were not operational and had not functioned since then. The spokesman, Sutopo Purwo Nugroho, complained at the same conference that his agency had not had adequate government funding in recent years, despite the frequent threat of earthquakes and tsunamis across Indonesia.